The eCommerce game is turning conversational. If you want to keep playing, you should be ready to talk the talk. The rise of voice-activated devices is changing the way people search for content, but also how they shop online. Rather than to see this shift as a source for panic, consider that within this revolution is an opportunity to get to know buyers like never before. Know thy customer; the holy grail of any eCommerce adventure. To know them is to cater to their pain points, solve problems, and get to the crux of how to retain people. At this juncture in history, we have more tech than ever to accomplish this. Recently, the most prolific is the all-hearing and all-knowing digital assistant. The digital assistant market is set to reach 15.79 billion by 2021. You’re no doubt familiar with the big guns – Amazon’s Echo, Apple’s Siri, Microsoft’s Cortana, and Google Assistant. These devices are developing to an advanced level of intelligence. They’re genuinely curious about your wants and needs, and they look for ways to cater to them. This affects eCommerce. Easy to use and effective in meeting your needs: which customer wouldn’t want that? Voice search isn’t only the domain of these specialist devices. We all know that the common smartphone has this ability, and will be improving as the tech develops further. With a voice assistant in every pocket, voice search is more important than ever. According to the Capgemini Digital Transformation Institute, 51% of consumers already use voice search. Approximately 30% of searchers will be done without a screen by 2020, Gartner predicts. ComScore anticipates that 50% of all searches will be voice searches by 2020. Per Alpine.AI, in January 2018, the frequency of voice search was expected to be in the realm of 1 billion a month. I could go on, but I think you get the point. Voice search has gone from a barely audible whisper to a loud bellow. What does this mean for your business? Read on to discover how to achieve this. If you want to be found, it’s imperative that you re-orientate yourself to the very essence of what a search engine has now become. While in days of yore (as in pre-2015), a search engine may have been likened to a catalogue – now it’s more like a personal shopper. This means that rather than popping in a few relevant words, users are interacting with search engines as if there is a human being on the other end of each query. Use trigger words such as what, where and how, knowing that your customers will be using those words too. Ok, maybe that was a little more detail than most searchers would divulge, but you get the point. Part of developing a more question-orientated approach is really getting to know your customer. If this is about having a conversation, who is on the other end of it? Detail your target market, and examine every inch of the customer journey. This has always been important, but never more so than now. You may have heard the term “semantic search” floating around. If you want to optimise for voice search, it is vital that you get to the bottom of what this term means. Semantics,very simply put, is the study of how we construct meaning through language. It follows that semantic search looks beyond the exact words that people are feeding search engines and tries to understand the why’s and the how’s behind those words. AI feeds on the entries to become more intelligent. As search engines have become more human-like, they go beyond the literal in search of the implied. Algorithms are programmed to concept-match and include synonyms, rather than only respond to cookie-cutter inputs. What does this mean for your eCommerce SEO strategy? You have to create a menagerie of terminology that may be similar but not identical to what you had envisioned for your products, whilst ensuring you don’t go too far down the rabbit hole. It is still vital that you keep your product keywords relevant, and the best way to do this is to refer back to point one in this list. What do they want to find out through their voice search query, and how can you ensure that you provide the answer (and associated product) they’re looking for? Ever heard of Google’s position zero? Essentially, Google’s featured snippet, otherwise known as position zero, is that fun little box that you see above the “first” entry on a SERP. While getting your content to this position is important for any type of search optimisation, the urgency to do this for voice search is beyond parallel. It means that Google rates your answer as the best to the question that has been asked. Guess which answer they are going to read out to their voice searchers? You got it! The best one, and nobody else’s. The problem is, the pathway to this position is somewhat enigmatic: Google has not provided a blueprint to follow. Luckily, we do have the sage advice of those who got there through careful experimentation, like Marcelo De Vivo who shares secrets with us in her article for Forbes. 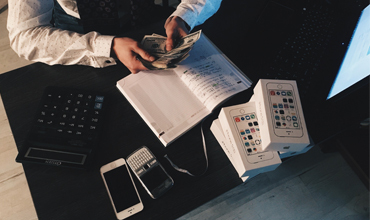 This is a dream if you are an omnichannel eCommerce seller who includes a physical bricks-and-mortar component. Local search, where users look to find out more information about products and services near their current location, is a major element of voice search. 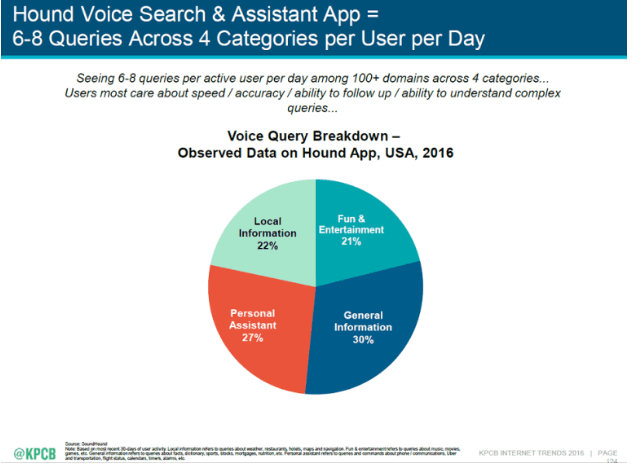 This graph from KPCB shows a voice query breakdown based on data from the Hound App. As you can see, local information comes in at a whopping 22%. When it comes to your business, this means that you should bring a local focus to your content. Start by adding location-based keywords to your site, where relevant. The next step is to consider your physical location when constructing your product catalogue. Perhaps now is the time to include those locally-sourced products that you’ve been eyeing. Time to raise your voice search strategy. If you have not yet included voice search in your eCommerce marketing strategy, now is the time. According to Walker Sands, 19% of consumers have already made a voice purchase with a digital home assistant and another 33% plan to do so in the next year. If you want one or more of those purchases to be from your store, the moment is here for you to get a voice search plan in place, and then start implementing it as soon as possible. Siri, Alexa, Cortana: How do I capitalise on this shift in consumer behaviour? “You need to have a voice search strategy in place”, they say in unison. Voice search is expected to approach close to 50% of all voice searches in the very near future and there are many people out there who aren’t jumping on the bandwagon and instead waiting until happens and then looking to play catch up. 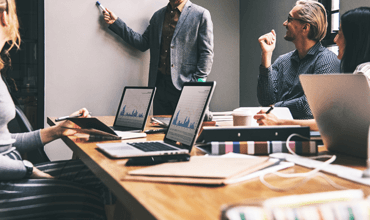 Your SEO agency should be guiding you on all things SEO and advising you on how to keep on top of the expected upcoming surge in voice search queries. Make sure you speak with and work with a quality SEO digital marketing agency who can advise you on and execute upon a voice search SEO strategy for your business.